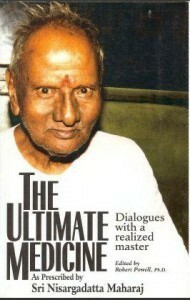 The Ultimate Medicine by Nisargadatta Maharaj was compiled during the last year of Nisargadatta’s life. The Ultimate Medicine gives detailed, advanced and precise instruction for spiritual aspirants seeking powerful antidotes to unawareness. Nisargadatta Maharaj is an extraordinary teacher from the Tantra Nath lineage. His style is abrupt and provocative, he cuts to the core and wastes little effort on inessentials. Detailed, advanced and precise instruction for spiritual aspirants seeking powerful antidotes to unawareness. How is his name pronounced, please?